Generate 100+ email ideas instantly. Basically just take a topic you’re trying to write about and apply it to a common concept in life that most humans can relate to. What my kids have taught me about [TOPIC]. Even my 3 years old understands [TOPIC]. [TOPIC] and having kids changed my life forever in a great way. How to explain [TOPIC] to a 4 year old. What’s the point of doing [TOPIC] if it doesn’t make my kids proud of me? What I want my kids to know about [TOPIC]. How I still manage to run [TOPIC] while taking care of kids. The tools I use to juggle [TOPIC] and kids. Why I’m teaching my kids all about [TOPIC]. The full story of my career in [TOPIC]. How I accidentally stumbled into [TOPIC] and made a career out of it. [TOPIC] changed my income forever. It wasn’t until 5 years into my career that I learned about [TOPIC]. How to start a career in [TOPIC]. How to make a career out of your passion for [TOPIC]. It’s not hard to make a career out of [TOPIC]. Here’s my guide how. The Pro’s and Con’s of a career in [TOPIC]. These will talk about a super juicy subject: MONEY! Everyone usually wants more money and ways on how to get it. So show people how [TOPIC] relates to money and various ways of getting more. [TOPIC] changed my income almost overnight. How much money does [TOPIC] make? How you can double your income in the [TOPIC] industry. I had my largest month ever with [TOPIC] by doing this…. One of the best money-making niches in [TOPIC]. How much money can you make if you consult on [TOPIC]? How much I make doing [TOPIC]. 3 tests I did this year that doubled my [TOPIC] income. The economy is shifting, and people in the [TOPIC] industry can thrive. Here’s why [TOPIC] is a great side-hustle. Here’s why [TOPIC] is a great long-term skill to learn. Most of my best friends I made through [TOPIC]. It was difficult telling my friends at work I was going to quit and start [TOPIC]. [TOPIC] lost me a lot of friends. [TOPIC] made me a lot of friends. [TOPIC] took a toll on my closest friendship because that friend was trying to hold me back. Some of my friends HATED that I was so successful with [TOPIC]. Soon as I got some success with [TOPIC] my friends started asking about it! It’s nice having a community of friends to support me in my [TOPIC]. My friends were always so curious how I started [TOPIC] in the first place. How [TOPIC] affected my love life. [TOPIC] was my first real love. When I was first learning [TOPIC] it put a strain on my spouse and I. Everyone that loved me was worries…..and that’s when I discovered [TOPIC]. I don’t think anyone loves [TOPIC] more than this guy. A loving spouse is what supported me the early and lean days of my [TOPIC] career. No one actually LOVES doing [TOPIC]…..but it’s a necessity. Learn to love [TOPIC] and it will make you a lot of money. I met my partner through [TOPIC]. How-to articles are often the most searched articles out there. Why not give the people what they want? How to [TOPIC] for a living. How to use [TOPIC] to double your sales. How one of my students used [TOPIC] to triple her sales in less than 12 months. How to create viral [TOPIC] posts on your website. How to make [TOPIC] proposals to large companies. How to generate tons of leads in the [TOPIC] industry. How to find people looking to buy [TOPIC] services. How to find people looking to buy large amounts of [TOPIC]. How to upgrade your [TOPIC] business without spending any money. How to make your [TOPIC] without hiring someone to do it. How to [TOPIC] like a rockstar. How to become the best at [TOPIC] and leave the competition in the dust. How to be the Michael Phelps of [TOPIC] and crush everyone else. How to get into [TOPIC] without spending a dime. This is where you open up about your challenges and struggles. People relate to you more when you open up and get vulnerable. This is your chance to let it all out…. I felt like I wasn’t good enough for [TOPIC] and could never succeed in it…. I’ve never told anyone about this from my beginning [TOPIC] days…. I didn’t choose [TOPIC]. My parents pressured me into it. At first it was tough…. The first time I succeeded in a [TOPIC] deal I was smiling so hard that it hurt my cheek muscles! I wanted to prove my parents wrong so bad, and that’s what pushed me to succeed in [TOPIC]. There’s no one that’s gone through more pain doing [TOPIC] than I have, and I want to show you how to avoid my mistakes. [TOPIC] is super easy if you automate scheduling using this tool. Here’s how you use Microsoft Excel to make your [TOPIC] work easier. Here’s how to use Google Docs to save all your [TOPIC] files. Here’s a trick I use with [TOPIC] clients that blows them away. Put this script in your email footer and you’ll likely get 2 more [TOPIC] clients per month. Take 45 seconds to install this Chrome Extension that every [TOPIC] person needs. Here’s how Photoshop can improve your [TOPIC] performance. Here’s how learning to outsource on Fiverr can help your [TOPIC] business. [TOPIC] + . A complete guide to setting up a [TOPIC] website. A full guide to outsourcing 50% of your [TOPIC] work without paying too much. Relate to people on an emotional level by sharing your fears and doubts. Many people have fears, so discuss them, and maybe even some solutions that you’ve found. For a full month I would wake up every night having nightmares about [TOPIC]. I was scared the first time I went to a [TOPIC] convention. Fear of succeeding in [TOPIC]….it’s a real thing. I don’t know about you, but the first time I worked with a [TOPIC] client I was super nervous. How to calm your nerves when giving a [TOPIC] presentation. My trick to calm myself down before giving a [TOPIC] presentation to important clients. Respond to this email and let me know your fears about [TOPIC]. Impart your knowledge of [TOPIC] on people by showing them some cool tips, tricks, tools and hacks you’ve learned over the years! 11 ways to make better [TOPIC]. Every trick I use to do quality work in the [TOPIC] industry. I could do [TOPIC] without these 13 free tools. In a world full of products for the [TOPIC] industry, here are the only 3 I use. Every successful person doing [TOPIC] uses this trick. Every successful person doing [TOPIC] pays for this research tool. 12 years of [TOPIC] experience and here’s the top 3 things I’ve learned. If you want higher [TOPIC] sales then implement these 4 hacks immediately. The lowest cost (yet highest ROI) trick I’ve learned in my 8 years of [TOPIC]. [TOPIC] tools you can use for less than $50 each. [TOPIC] changed my life forever for the better. The first time I heard about [TOPIC] it changed everything. I never knew the impact [TOPIC] would have on me. The best thing about [TOPIC] was the way it changed my life. When I got good at [TOPIC] it changed my life. The first book I ever read on [TOPIC] altered the course of my entire life. When I started learning about [TOPIC] it felt like I found my calling. There was something just so enjoyable about [TOPIC]. I felt completely comfortable learning about [TOPIC]. One time at band camp I started [TOPIC] and…. [TOPIC] and having kids changed my life dramatically. [TOPIC] really changed my life forever. How-to articles are often the most searched articles out there. Why not give people what they want? Here’s how KopywritingKourse.com helped me increase my [TOPIC] business. [TOPIC] and . A complete guide to setting up a [TOPIC] website. 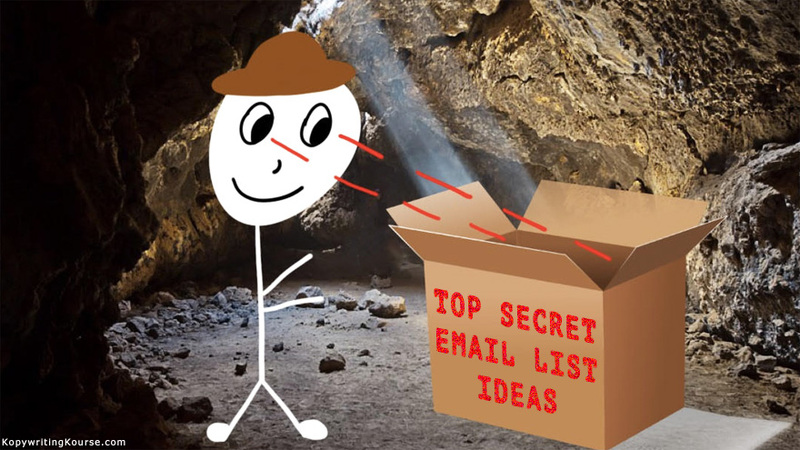 Enjoy all the email list ideas, hopefully they help jog your brain down the right path! Want to see how I personally sell through my email list? Join my email newsletter and you’ll get 1-2 emails per week with my best content. I’ll also immediately send you this entire list of Email Idea Formulas to keep. Join here.